The super-awkward relationship between US President Donald Trump and French President Emmanuel Macron reached new depths at the NATO summit in Brussels, with Macron snubbing him for German Chancellor Angela Merkel. The pair endured an awkwardly long handshake earlier Thursday, with both Trump and Macron tightly grasping each other's hand for longer than was entirely necessary. As Macron approached a group of leaders leaving NATO headquarters, Trump stretched out his hands in greeting, but was completely ignored by the new French president, who instead headed straight for Merkel, giving her a warm embrace while Trump smiled awkwardly. 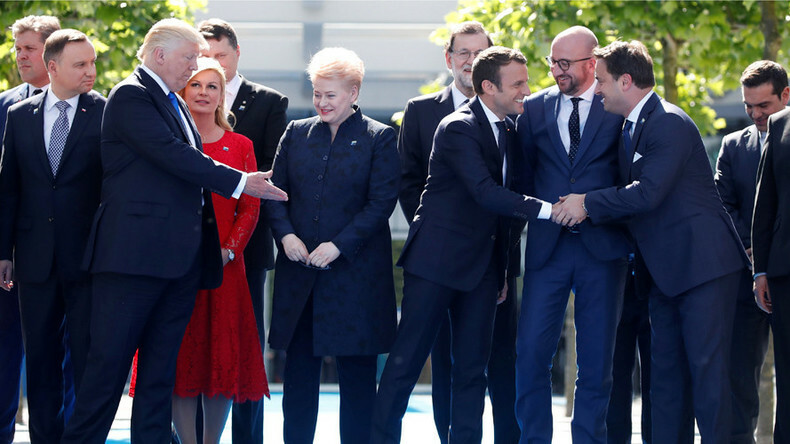 Macron then turned his attention to Nato Secretary General Jens Stoltenberg standing between Merkel and Trump, before cruelly turning in the opposite direction to greet Belgian Prime Minister Charles Michel. As soon as Macron turned his head in Trump’s direction, the US leader was waiting with his hand out. Trump grabbed hold of Macron in one of his trademark long grab-and-pull handshakes. Macron had to place his other hand on Trump’s arm to help leverage himself from Trump’s grip. Trump became the subject of a meme earlier in the day, when he was caught rudely pushing past Montenegro Prime Minister Dusko Markovic. He also chose to pat UK Foreign Secretary Boris Johnson on the shoulder instead of shaking his hand. Macron tweeted a video of the awkward moment later Thursday, although he didn't comment on the handshake.